Have you checked out the Public Math iOS stickers recently? We’ve added a few new stickers into the collection. If you don’t see them, be sure to update the stickers in the App Store. Happy searching! If you’ve got ideas for new ways to play, please get in touch. Unfamiliar with how to use iOS sticker apps? 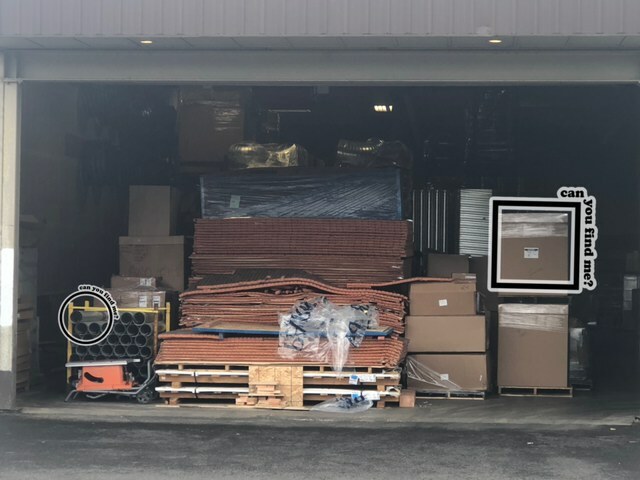 Read our Project post on how to get set up using the app. 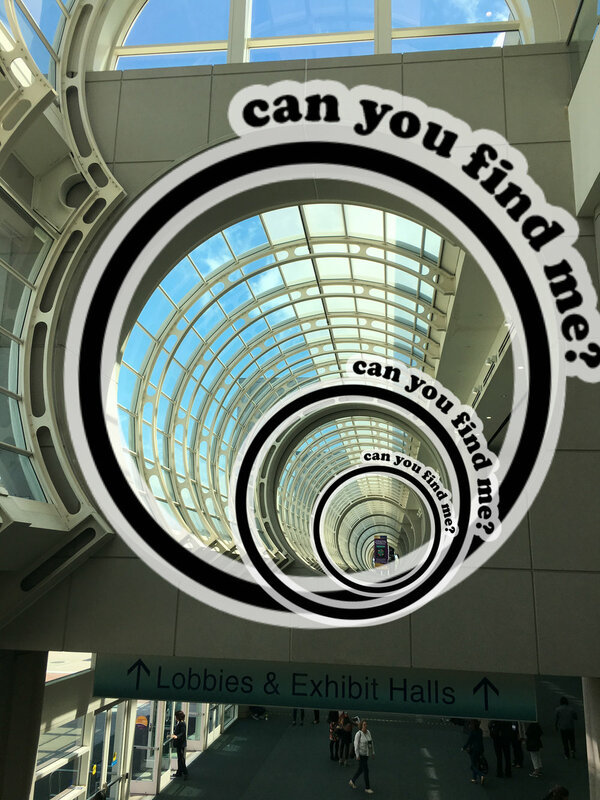 Going to the NCSM and/or NCTM Annual Conference in San Diego this year? We’d love to talk! The culture within startup companies is often characterized by shared commitment to innovation, healthy risk-taking, and an asset-based approach to team building. Productive collaborative communities in education look much the same. This session will examine a case of like-minded educators overcoming barriers of time, resources, and isolation to form a community poised for action. We will identify essential elements of meaningful collaboration and describe how to cultivate startup values within new and existing educator teams. We’ll be there playing games alongside you - and we’ll be bringing some Public Math goodies to share! Install the Public Math iOS Sticker pack from your phone or your iPad (it will open up in the app store). 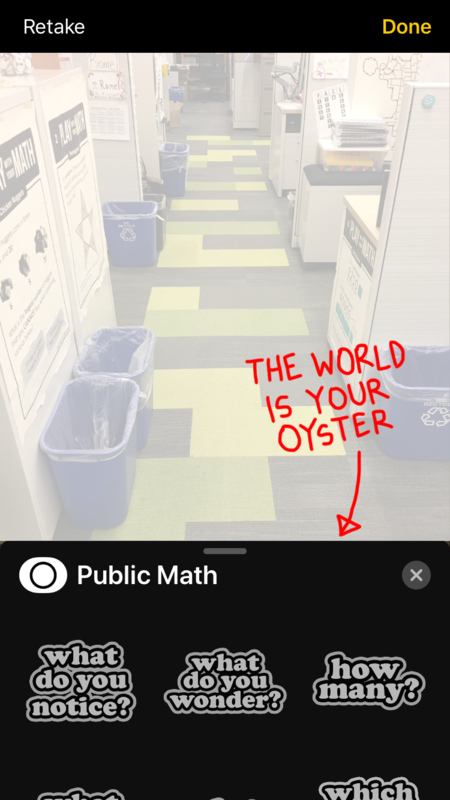 From the Messages app, take a photo or record a video of something that invites math play! Now that you’ve taken the photo, tap the effects icon on the bottom left of your screen. Browse through the stickers and tap the one you’d like to appear. Use your fingers to place, rotate, and resize the sticker. Once you hit “Done” on the top right, the image will save into your Photos library. But it’s more fun if you send it off to your friend or share it on twitter - we promise! See the gallery below for some ideas! 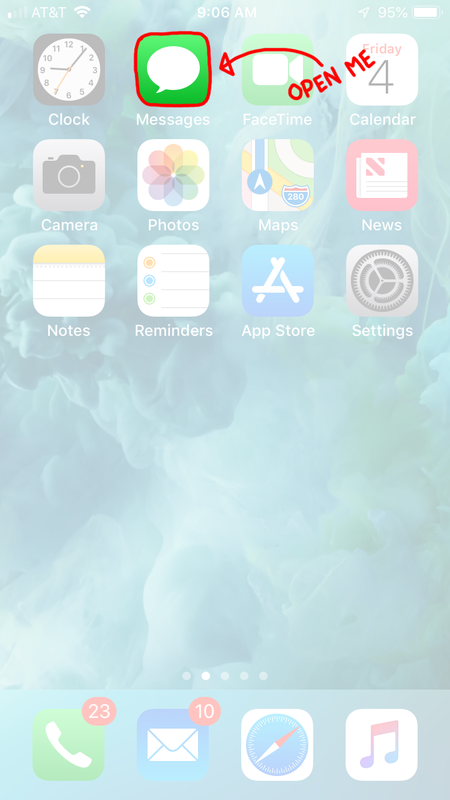 Learn more about using stickers with iMessage on your iPhone, iPad, and iPod touch here. 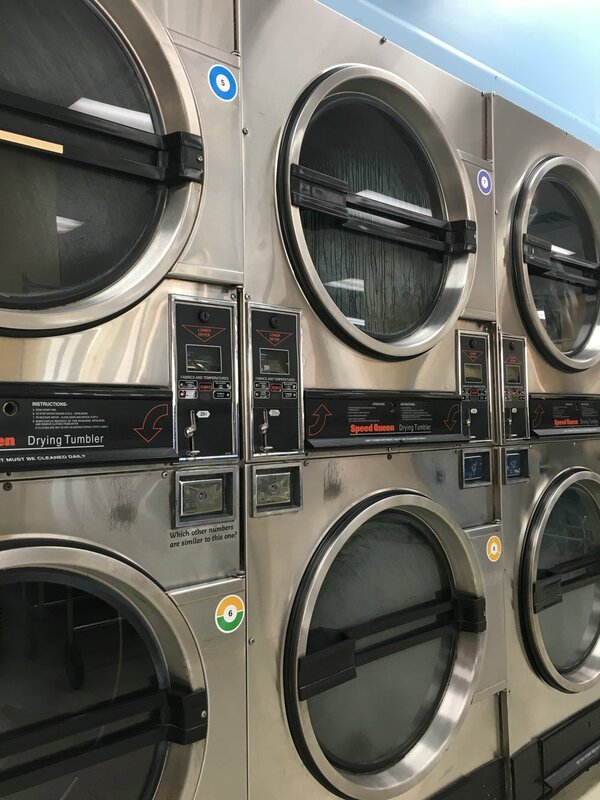 This post documents the process of how Math at the Laundromat was developed and implemented. I hope that detailing the process will shed light on how you can start Public Math projects in your community. I cannot emphasize enough how important collaborating was throughout this entire process. No idea, design, etc. was designed in isolation, but always iterated, play tested, and critiqued by an awesome group of collaborators. A special thank you goes to Dan Finkel (mathforlove.com) who graciously shared his designs with us. William is a friend of mine from church who owns a Mr. 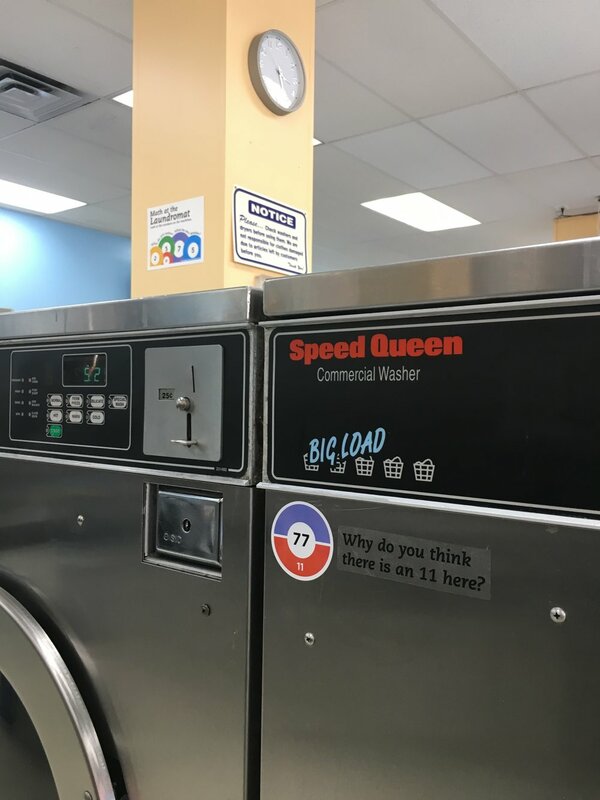 Bubble, a laundromat in Chicago. I asked if he would be willing to mathematize his laundromat. I showed him photos from my visit to Math on a Stick as well as designs by Math Anywhere (having proof of concepts were essential) to give him a sense of what I was talking about. Without knowing exactly what this was going to look like, he agreed. I visited Mr. Bubble with William to learn more about his point of view. 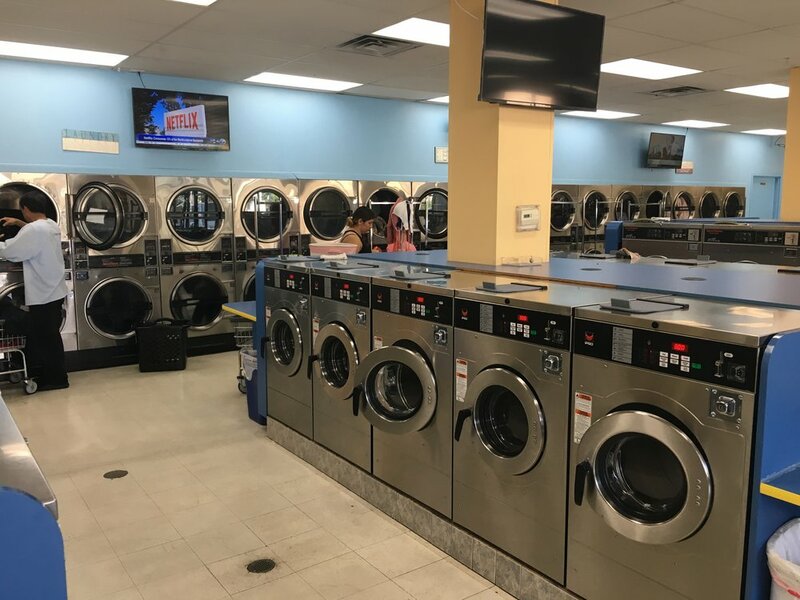 I asked him a lot of questions to learn more about the laundromat - “Where do your customers spend most of their time? What are they typically doing there? 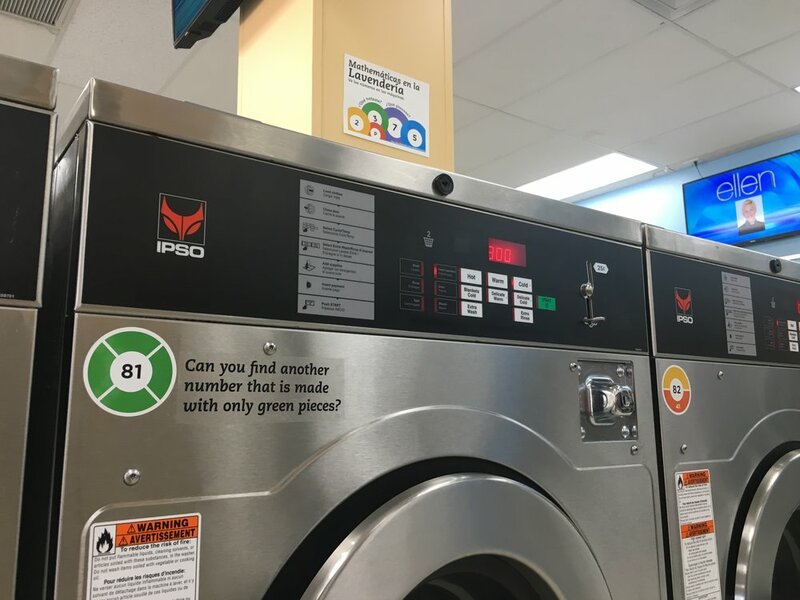 What do these symbols on the machine stand for? What are the numbers on the machines about?” Then, I began mixing in ideas that came into my head. It didn’t matter if I thought the idea was good, bad, feasible, or unrealistic. His reactions allowed me to get a sense of what he liked/disliked, what would be allowed in his space, and how he imagined his customers would interact. During my visit, I took a lot of photos - more than I felt necessary. I hoped that while looking at them later, something I had not noticed before would provide insight for a design. Photos and ideas were shared with other people collaborating on this project. The issue was, every idea seemed pretty great, so it was hard to know what really deserved to be pursued. The only thing I could say was necessary during this step was time. I think stewing on ideas with others eventually led to us feeling like some ideas had lasting power while others we naturally forgot about. Some ideas began to emerge as more interesting. 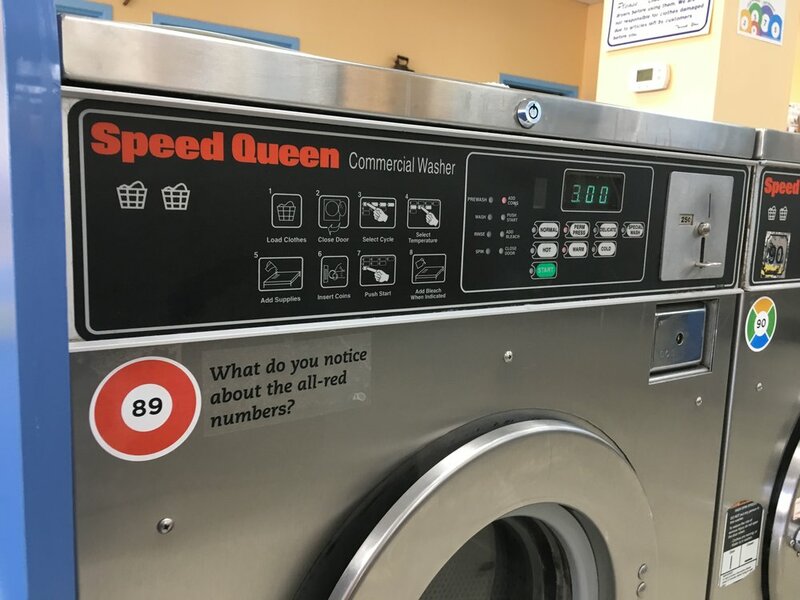 One of those ideas was merging Dan Finkel’s Prime Climb design into the numbering on the machines. I emailed Dan who was super generous in his sharing of his designs (as I find most people in the education community to be) and got to work! Important mini-step: prototype! Very early on, I showed William a prototype of the sticker and he approved, had he disapproved, it would be back to the drawing board. It was then a matter of resizing and printing the stickers on Avery 2.5 in circle labels. They’re $9 for 25 sheets with 12 stickers per sheet (you do the math). Collaborators then helped shape the questions that would be next to some (not too many) of the numbers. 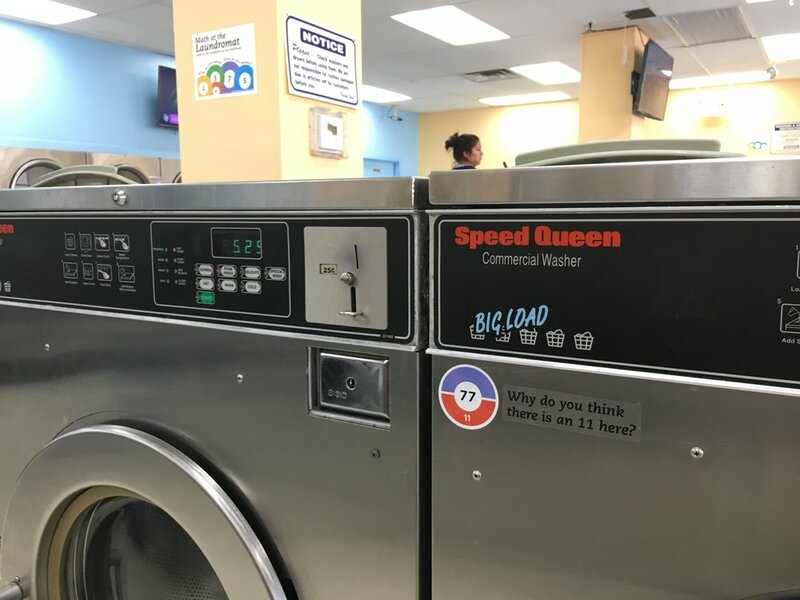 I met William at the Laundromat with everything printed. He was kind enough to help do the nail-damaging work of peeling and sticking stickers, but we were in a celebratory mood! We had an idea in our heads and were able to make it a reality. After installing, we realized that even more math at Mr. 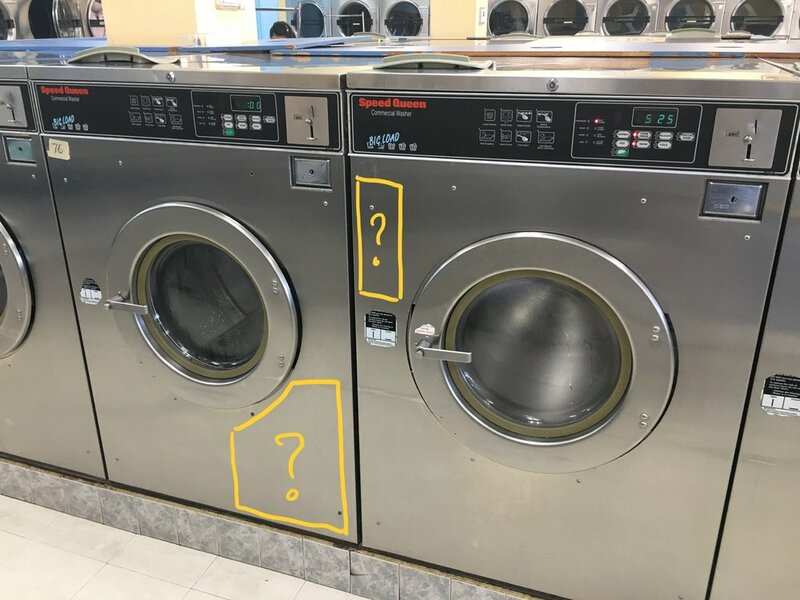 Bubble might feel a little suffocating and distract from the goodness that exists in prime climb, so he suggested using another idea that we have (hint: they’re all about socks) at his other laundromat. I found the next steps conversations was really natural to have because the installation piece had a lot of positive energy. Dan Finkel has been kind enough to allow us to share all of the designs for this project. You can find and download them here. Please reach out if you have any questions! A zine is a small, usually self-published, physical magazine. At the first Public Math Gathering over Labor Day weekend, we developed a zine—titled Shapes Symmetry Spins at the Minnesota State Fair [pdf]—and distributed it around the fairgrounds. We’ll be leaving these in Little Free Libraries and actual libraries, on buses, in schools, and in waiting rooms. We invite you to download, print them out, and do the same. Egg Yolks! and Hilbert Curves are formatted for standard US letter paper, which is 8.5 by 11 inches. More are under development. We’ll share them here. If you’ve got an idea you’d like to see executed (or a mathy zine you’re willing to share), send it our way via the Contact page. Over Labor Day weekend, we held the first Public Math Gathering, a 48-hour kickoff to collaboration that brought together a diverse group of educators, mathematicians, researchers, artists, designers, and scientists. 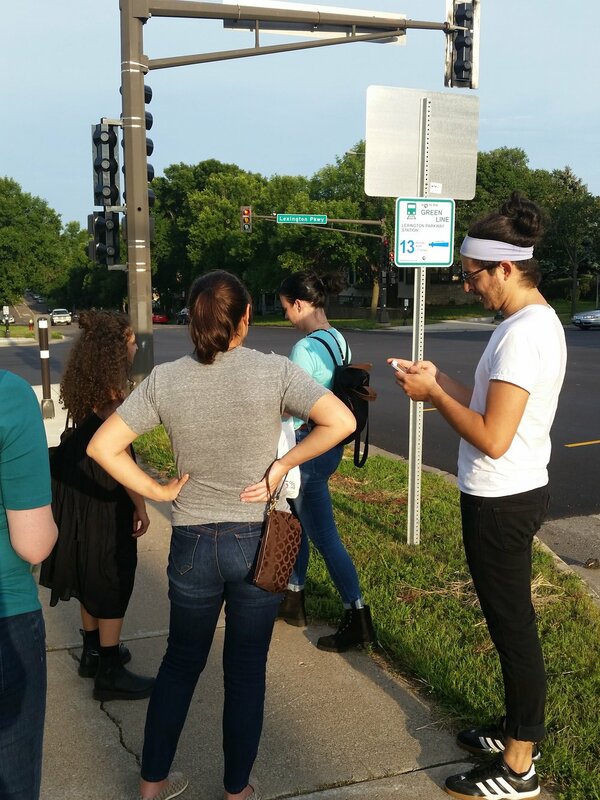 We began on Friday evening by walking the neighborhoods of Saint Paul looking for math and also for ways in which the landscape has been modified for purposes not originally considered. The rain garden and signs about walking to the Green Line pictured below are both retrofits, for example. Somebody had ideas about how to use public space differently, and they dreamed these things into being. On Saturday morning, we volunteered as a group at Math On-A-Stick at the Minnesota State Fair before reconvening off site to debrief that experience and to design and build new ideas. Details on each of these will be coming in this space, including progress reports and ways you can use, share, develop, adapt, and contribute to this work. Stay tuned!